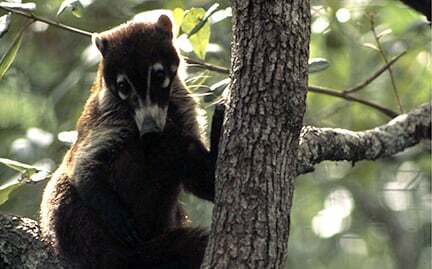 Active during the day, coatis spend time both in the trees and on the ground. They have strong claws and a long, flexible nose that sniffs out food in rock crevices and under leaf litter. Females give birth to a litter of up to seven young and care for them in isolated tree nests. Mother and offspring rejoin the social group once the young are able to walk and climb.